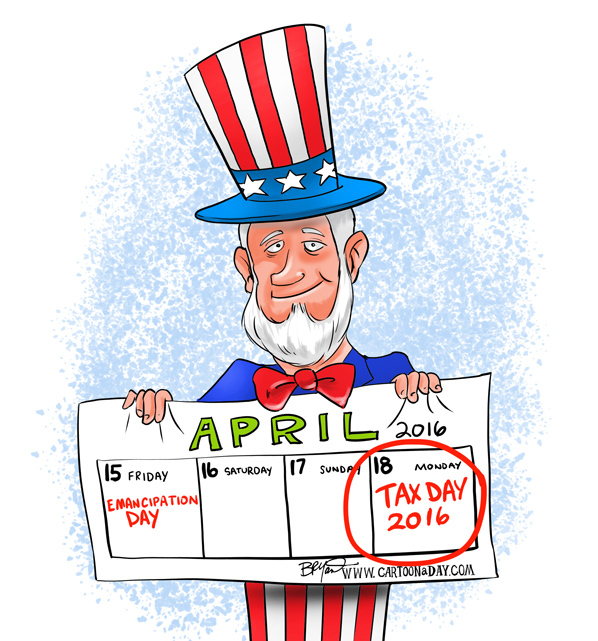 This year, Taxes are NOT DUE on the traditional April 15th. Instead they are due this year on Monday the 18th, giving all us procrastinators an extra weekend to put off filing our taxes. We can thank President Lincoln in part for this change since Friday the 15th is a National Holiday celebrating the day in 1862 he signed the Compensated Emancipation Act which freed more than 3,000 slaves in D.C. This act was the precursor to the Emancipation Proclamation freeing over 3 Million slaves. This holiday means the IRS considers Friday the 15th a National Holiday, and mail will not be picked up.